Analyzing data, taking the business decision based on the data has become the core part of a business. Genius data analysts (with the help of world class programmers) are making complex algorithms just based on every data they can collect. In the blink of an eye, computer generated algorithms are making billions of dollars trades every day. Businesses are monitoring every step of their customers, taking the important decision based on collected information. Smartphone applications are tracking people everywhere. What they’re liking on Facebook, where they’re checking in for some foods or travel, what products they’re searching in Google; all are important information for businesses now. The demand for data analysts has made them the top paying professionals in a business. So, you might think that whether Excel is the best tool to be one of them. No, Excel is not the best tool and not the only one. But as a starting tool and for small business decisions, it is the best tool. On this page, I’ve collected the best books that will help you perform better data analysis with the business information. Excel was always the best and easy going tool for data analysis and will be in future. Why is this book best for mastering data analysis? Want to just choose one book for starting your data analysis career? It’s the fifth edition and it is for Excel 2016. There are several reasons, I have chosen this book as my top book to master data analysis with Excel. 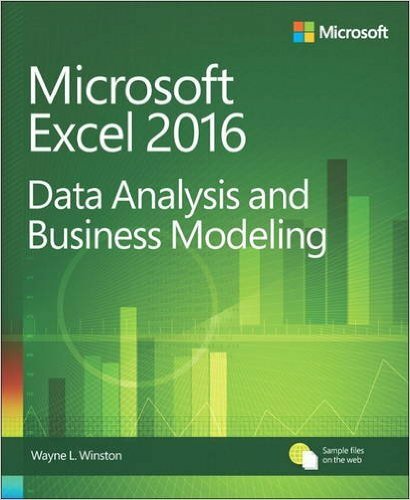 This book has covered almost all the materials to analyze data with Excel. The version I use (written for Excel 2013) has 889 pages with 87 chapters. He has his own consulting firm and uses the same techniques (taught in the book) for solving his clients’ business problems. So what you will get is the real-world problem-solving approach. He is teaching data analysis and business modeling to MBA students at Indiana University (Kelley School of Business) for last 20 years. He has taught thousands of Fortune 500 corporations analysts. The chapters are short. At the end of every chapter, you will get practicing problems (in total more than 600) with solutions (the best part). In a sense, data analysis means actually statistical data analysis. But I am making a different list here. This list consists of the books that focus wholly on statistical analysis using Excel. Why am I referring these books (data visualization books) here? You know how to analyze your data but don’t know how to make the presentation of your analysis, then you only the 50% of the data analysis. And even knowing the data visualization techniques can improve your data analyzing power. And this list contains the best books on data visualization, hand picked by me and very carefully selected. SQL is the ultimate tool to analyze millions of rows of data. Learning some SQL techniques can boost your data analysis ability hugely. This book is one of the best in SQL category in Amazon. So, this is a complete list of data analysis books that you can use or buy. If you’ve any other important book, please let me know and I will update this list.